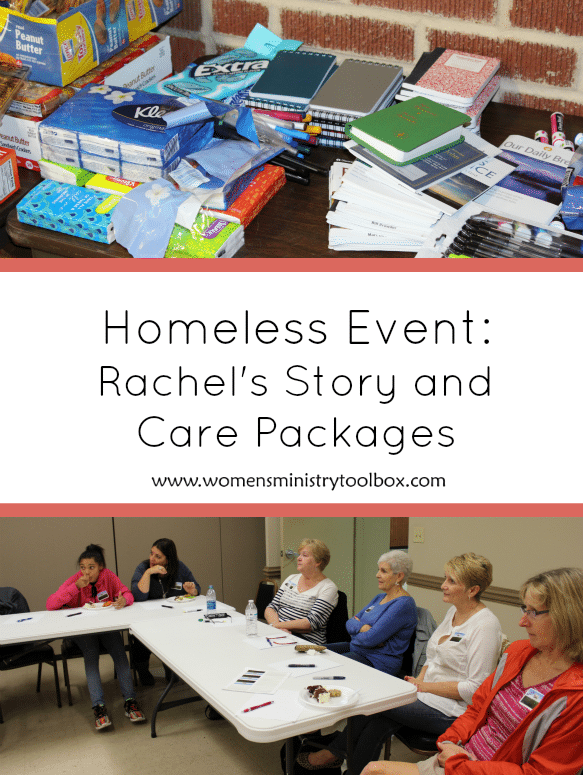 Back in the fall our women’s ministry team held an event focused on the homeless in our area. We invited Urban Ministries to come and share about the work they do. After their presentation we assembled Care Packages for the Homeless. 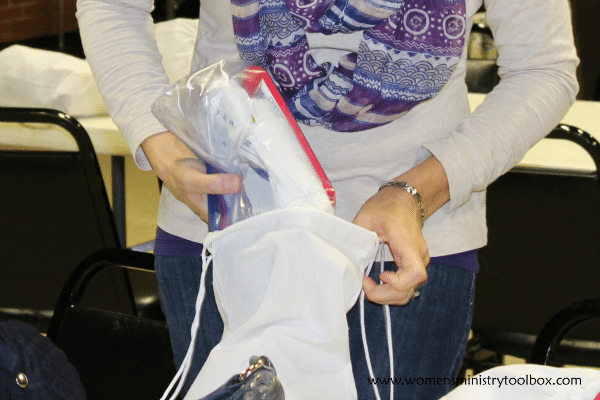 We could have easily assembled the Care Packages on our own, but it was the presentation from the community ministry that challenged and burdened our women. Urban Ministries shared the true story of one of their “neighbors”, as they call them. “Rachel’s” story was detailed and disturbing. After each piece of her story was shared, we’d stop and discuss her situation and choices up to that point. It really bothered the women in our group that no one, not a single person, had stepped in and discovered the abuse, the drugs, and other things that were going on her life. If just one person had gotten involved, Rachel’s life could have been so much different. We discussed how God calls us to love our neighbors, not just the ones we like, the ones on our immediate street, or the easy neighbors, but every person God places in our path. When we fail to love our neighbors, when we fail to be Jesus in someone’s messy life, we miss God-ordained opportunities. Each of us left that evening with our eyes more open to the needs around us. None of us wanted another “Rachel” to endure such abuse and neglect. Hearts were changed that evening. Oh, dear ones, that should be the goal of every women’s ministry event we hold, no matter the topic! We finished our evening by assembling care packages to distribute to folks in need that we encountered in our community. We prayed for opportunities to love our neighbors. For God to place us in the path of the “Rachels” in our community. Items were placed inside canvas drawstring bags that we had purchased from Oriental Trading. (Similar to these – not an affiliate link.) We included a sharpie inside each bag so they could write their name on it if they desired. We also included a printed note card in each bag with our church’s contact information. Many of the women added personal notes of encouragement and scripture verses to the blank side of their cards. Can I be really honest with you for a minute? I really wasn’t excited about this event. At all. I’m not usually a fan of one-and-done mission projects. I much prefer mission/ministry projects that open doors for ongoing relationships. This event changed hearts in a way I did not expect. I suspect some of our women will look into serving at Urban Ministries where they will have the opportunity to build relationships. I’m thankful God was in charge of the evening and not me. I’m also glad I didn’t choose this mountain to die on. Have you done a similar event? What was the impact on your women? Who is God asking your women’s ministry to adopt?